Do you have recurring head, jaw, or neck pain? Are your jaws frequently popping, clicking, grinding, or locking? Schedule a checkup right away. You might be suffering from temporomandibular joint disorder (TMD). The temporomandibular joint (TMJ) is the joint that connects the mandible, or the lower jaw, to the skull’s temporal bone, the bone in front of the ear on both sides of the head. This hinge joint is flexible and helps the jaw move from side to side or up and down. The muscles connected to the jaw joint also help control jaw movement and position. Most cases of TMD began long before you even knew what your jaw was! TMD is often a developmental issue that was never caught or treated. Your upper arch never expanded as it should have, which brought it out of alignment with the lower arch. Imagine trying to put on a pair of gloves, but you just can’t quite get your fingers to settle perfectly into each finger space. The seam is rubbing between your fingers, and you can’t relax your hands because you are trying so hard to get those gloves to fit correctly! When your jaw is out of alignment, that is what it feels like all the time. There is never any rest for your jaw because it is constantly straining to be in alignment. Eventually, your muscles and joints will start causing symptoms that you can be looking for. In addition to the years of discomfort that TMD can cause, you should know that most patients who have TMD also have sleep apnea. 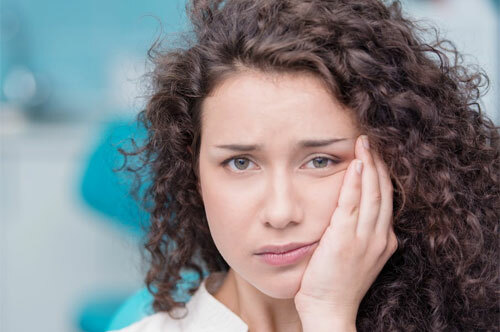 The two conditions go hand in hand, so if you are concerned that you may have TMD, let this be one more reason you pick up the phone and call today! People with TMD have pain or dysfunction in the jaw, jaw joint, and nearby facial muscles. To diagnose TMD, your Carmel dentist will evaluate your medical history and physical examination to determine the cause of the pain and dysfunction and rule out other conditions that may be causing the symptoms. We begin this process by helping your jaw find its most comfortable position. Once we know where your jaw wants to be, we can develop a treatment plan that will allow that natural comfortable position to be the norm. This often means treating the alignment of your teeth or wearing an oral appliance to retrain your jaw. The jaw joints will be checked for pain, popping, grating, or clicking sounds, limited movement, and locking while closing or opening the mouth. The bite and function of the facial muscle will also be evaluated. At Really Smile, digital imaging is also used to determine the cause of head, jaw, or neck pain. Dr. Smith practices neuromuscular dentistry, which focuses on how the masticatory system works, to find faster and long-lasting solutions to TMD. To learn more about TMD, TMJ, and permanent relief from headaches, jaw pain, and neck pain, contact Really Smile in Carmel, Indiana today! You may dial 317-451-4050 or use our online form here.